FRATER » Blog Archive » EXTRA, EXTRA, read all about it! 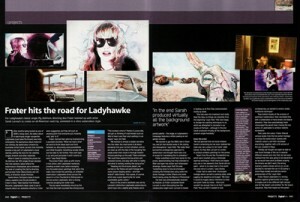 For this months Digital Arts (January 2009) magazine we were asked to do a feature about Ladyhawke’s ‘My Delirium’ music promo. So we rattled off some rambling answers. Click on image for the large readable version and save yourself £5.99. This entry was posted on Monday, December 15th, 2008 at 1:09 pm	and is filed under News. You can follow any responses to this entry through the RSS 2.0 feed. You can leave a response, or trackback from your own site.